Listen to the podcast. Find it on iTunes/iPod. Read a full transcript or download a copy. Sponsor: Partnerpedia. 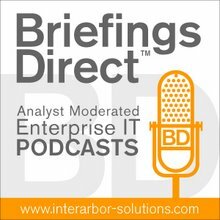 The latest BriefingsDirect podcast discussion focuses on the impact that mobile devices and applications are having on enterprises. We specifically examine what steps businesses can take to better manage mobile applications and develop their own versions of enterprise app stores. The skyrocketing popularity of mobile devices like smartphones and tablets has, on one hand, energized users, but on the other hand, it has caused IT and business leaders and CIOs to scramble to support these new clients productively and safely. We're really at this rare moment in time for the technology sector, whether you're talking about vendors, end-users, or CIOs who are trying to manage all this. The app store trends panel consists of John McCarthy, Vice President and Principal Analyst at Forrester Research, and Sam Liu, Vice President of Marketing at Partnerpedia. The disucssion is moderated by Dana Gardner, Principal Analyst at Interarbor Solutions. Gardner: How profound is the shift that we're in? Is this iterative, or are we in a real sea change? McCarthy: It’s definitely the latter. We're really at this rare moment in time for the technology sector, whether you're talking about vendors, end-users, or CIOs who are trying to manage all this. It’s not just mobile. It’s not just cloud. Software as a service (SaaS), smart computing, machine to machine, analytics, social -- all these things are spinning up together to create an accelerating array of change in the marketplace. Gardner: You mentioned cloud and SaaS. It seems to me that the mobility issue is almost accelerated in a virtuous cycle. That is to say, the more mobility, the more reliance on cloud, the richer and safer it is. The more confidence people have in cloud, the more they can do with their mobility. McCarthy: These things are feeding off of each other. As soon as I start talking about deploying mobile, and increasingly, it’s not just deploying mobile to my employees, but deploying mobile to my partners and customers, whether it’s B2B or B2C, I am talking about a much broader network problem. So the network architectures of the cloud solutions are becoming almost synonymous with mobile solutions. So the two innovation cycles are intersecting and feeding off of each other. Gardner: What is it now that organizations need to do to get their very necessary mission-critical information out to these mobile devices? How does it compare to the past? McCarthy: The analogy that I draw, when I have discussions with clients now, is that it’s like being the captain of the Titanic, if you're the CIO. Everybody is focusing on those things that they see above the waterline -- how am I going to design these applications and how am I going to deliver them? There's this whole debate of whether I need to go native, hybrid, or browser-based. But below the waterline is a huge broader part of the iceberg -- how am I going to manage these applications, how do I need to rethink my security architecture, is SOA really going to be enough for the level of integration that I need? The skill sets that I need as an IT shop are very different in this world? We are working from a current research point of view that mobile and all these other things that are being bundled up with it that we just talked about are going to drive probably an order of magnitude bigger shift in IT and the CIO’s organization than the PC did 20 years ago. It’s the PC shift on steroids that we are going to be looking at over the next three to five years as mobile completely enables companies to rethink their business processes, and that drives rethinking of their technology architectures, management, and skill sets underneath that. Gardner: Sam Liu, why does the app store model have applicability to the enterprise? Liu: [The app store model] is setting the bar in terms of the user experience in the enterprise, the fact that people who are both consumers and employees of companies are essentially buying the devices, bringing them into the workplace, a nd forcing the issue onto IT. You have the mobile professionals and power users of the company taking what they've experienced in the consumer role and requesting a similar experience in the enterprise. The challenge for IT is that this opens up a whole new can of worms for them in terms of policies, procedures, security, and control. If you look back maybe 15, even 10 years ago, a mobile device was somewhat of a luxury, used by a few people in the company for primarily email. Most of the time, it was a BlackBerry device. We've gone from a singular device and a singular application environment to this perfect storm of a combination of a multitude of devices, platforms, and apps, popularized by the consumer world. That's a big challenge for IT. Gardner: John, how confident are you that the app store is going to be an integral part of what the enterprise does vis-à-vis mobility? McCarthy: Clearly the notion of an app store is an interface to this technology. The rate of change and the complexity of this environment basically says that I need more of a self-service module. I can’t go out there and hand-provision these applications like I did in the PC world. The rate of change and the complexity of this environment basically says that I need more of a self-service module. Because people have become so accustomed to this app store model, as Sam just pointed out, from a consumer adoption point of view, that user interface paradigm is going to continue over. I think what’s going to happen is that, behind the scenes, the enterprise app store functionality, from a management point of view, will be much richer over time, and that's where the divergence is going to be. But as an interface and a way to get people the information and applications, there's one school of thought that says these app stores will replace the old intranet as the paradigm for not only getting apps, but actually subscribing to information. Using technologies like Flipboard where you subscribe to the travel policy and you ultimately get the most updated version of that. That it’s going to evolve pretty dramatically from where we are today. It’s going to be the user interface paradigm to all this management capability that IT will use, but also these additional capabilities that the end-user -- whether that's customer, employee, or partner -- will access. Liu: I agree with John on the point about the app store becoming the sort of mobile intranet paradigm. Today, I'm not seeing any corporate intranet that work even halfway decent on a mobile device. So if you extend the concept of an app to content, information, anything that is relevant in a corporation, the app store paradigm is a very nice interface and a very effective delivery model for a mobile intranet, for that matter. McCarthy: The other thing Sam is that, if you think about these apps, they're called apps, because they are not full-fledged applications. They're much simpler and task-oriented, so there's going to be more of them to manage. The app intensity of the organization is going to grow geometrically, as we start to unbundle these big complex systems like SAP and Office and provide them in more digestible and more segmented experiences. It’s no longer a one-size-fits-all world. The homogeneity of these applications and the PC as the end-user device is blowing apart as we speak. Gardner: What is it that people need to do? Should they build, buy, partner? How are you seeing it manifest in the market? They're not going to be able to stop it, and so they're trying to figure out the right approach to dealing with all this multitude of devices and applications. Liu: You're going to see a range of approaches. We've been talking to about a dozen or so enterprise IT organizations. The majority of them are in the early stages of trying to figure this out. They see the momentum coming. They're not going to be able to stop it, and so they're trying to figure out the right approach to dealing with all this multitude of devices and applications. In most cases, they seem to be prompted by the influx of tablets and smartphones, but many of them are thinking beyond that. They're actually planning ahead. They're thinking about devices in general. It could be a mobile device or it could be even a desktop or a stationary endpoint. So they're looking beyond the immediate issues. Our advice to them is, look, figure out your near term and long-term objectives, and then scope a pilot accordingly. Start with a clear definition of what you're trying to accomplish from a business standpoint, the objectives and the metrics, and then go about it that way. Identify the most pressing needs in terms of the users, apps, and devices and define your first project around that, so you can get a handle around what’s feasible and what’s not. One of the challenges is that clearly the technology has changed a lot, but also just the lifecycle of hardware and software. It used to be anywhere between three to five years that IT could depend on. Now, you're looking at one year for changes of the devices, platforms, and new apps. That rate of change is also a big challenge for them. McCarthy: There are two things happening in parallel. People are moving out of the renegade pilot phase, and as Sam laid out, trying to take an architected approach. How do we holistically look at what our strategy is around mobile? Not just developing the apps, but how are we going to manage the apps? How are we going to manage the fact that different constituents, both internal and external, need different amounts of functionality and different amounts of security is driving it? The other thing that we're seeing happening is, companies are now saying, "Oh my God, how am I going to manage the lifecycle of these apps? It’s relatively cheap and easy to build them, but how do I keep up with the endless releases that are going on and the operating system wars on these devices?" Apple and Google are doing four operating system releases a year that you need to manage to make sure your apps still runs. Then there is the whole point, particularly in the customer-facing space, of how do I update my app so that it stays competitive, and we can really use that system of engagement with our customers to build that ongoing communication, which every company wants to get with their customers? What we are seeing is that people are starting to look at how to manage the lifecycle of these apps and then, in parallel to that, I need to figure out what are my policies going to be and then how do I enforce or instantiate those policies That's where people are turning to these enterprise app stores from the vendors. Then there is the whole point, particularly in the customer-facing space, of how do I update my app so that it stays competitive. It's less of a selling and more of a management prerogative and design point. Then, of course, there is the complexity of the device environment. Liu: The enterprise app store, is all about the app, how to procure and vet the app, so to ensure security and integrity, as well as distribute it to users, and controlling which users can have access to which apps. Also, it's enforcing policies, such as mandatory installs and updates of versions. Those are overall key elements of enterprise app store. That said, it's not the end-all be-all. Enterprise app lifecycle management is much more than that. It's another issues, from tools to the actual hardware device controls, but certainly when it comes to apps and managing apps on mobile devices, mobile users, the enterprise app store is a big component of that. Some enterprise app stores don’t go beyond a basic app distribution and tracking, but in others you'll find features such as license management. Not all apps will be developed in-house. Some will actually even be purchased from third parties. In a mobile world, you can expect to see more and more of that, only because, if nothing else, most IT organizations don’t have the system and the resources in-house for mobile devices and apps, so those tend to look outside to third parties for their solutions. So in that situation, license management is an important part of enterprise app stores, so that IT can actually control just who has what license. If their job changes, we can bring it back and reallocate it to another user. Otherwise, you lose that cost that you paid for the app. Things like that should be built into enterprise app store. You can also do bulk licensing. Most recently, you saw Apple’s program around bulk purchasing for businesses. Similarly, enterprise app stores will have some mechanism, when it's applicable, where companies can make bulk purchases and manage a pool of licenses across entire employee or contractor base. Gardner: John, do you see an economic benefit to this as well as a convenience and productivity benefit? They have to go out to a third-party universe, because the value isn’t going to come from managing these things. McCarthy: Initially it's going to be, "I need to manage these things." It's going to be knowing what's out there and making it easy for people to get at these things. Sam made the point that this is much more of an ecosystem play. This notion where I am going to be developing everything myself isn’t going to work. There's going to be a lot of these third-party apps that the company, either on their own or through their services provider vets and says, "Here are all these other productivity apps that you can take advantage of. We have made sure that they work with our core business apps that we've developed." But that focusing of what are limited IT resources is part of what's driving the app store phenomenon. IT doesn’t have time to build this themselves. They have to go out to a third-party universe, because the value isn’t going to come from managing these things. The value is going to come from these new customer or employee apps that allow us to rethink our business processes. We need to manage that complexity or we're going to have huge liabilities and huge risk and compliance issues. Gardner: Sam, it sounds as if the enterprise app store could also have a benefiting role when it comes to a hybrid model. Apps might originate with third parties, clouds, or SaaS providers. So is that the vision over time with these app stores? Liu: It shouldn’t matter, especially to the employee or the user, where the apps come from or who built it. It's all about the experience. Also, in some ways it shouldn’t matter what device they're coming in from, whether it's a smartphone, an iPad, laptop, or desktop. There should be a similar rich user experience that’s appropriate for that particular form factor. So you abstract these hows and whats from a user standpoint. It becomes a more user-friendly and more productive environment for the user. McCarthy: I think we are going to see more and more of these apps driving the reinvention of business processes. The reliance on these apps is only going to explode over the next three to five years. So we need a way, as we have talked about, where it's easy to find those apps, but also it's easy to manage those apps. It's serving both sides, serving the needs of the businessperson or the customer, but also serving the requirements of the organization to allow us to harness this, but minimize the cost of managing these devices, making sure that they are secure, that we are not doing stuff with consumer data that’s going to get us into trouble. This is part of the whole rethinking of management and security in a world where it's much more mobile and much more outside the firewall. Gardner: Any thoughts about the future for how businesses use app stores, not just internally, but as a business channel? Liu: Actually we've run into a few enterprises already thinking in that mode. Initially when we talk to IT, they're thinking about the internal issues, especially about controlling management policies, but they're also being asked to build systems that are customer-facing, and in some cases systems that deliver and sell products to customers. So, where it applies, such as software and apps, they're looking at how to use the same paradigm for delivery of app services and apps to end customers. So it's potentially a new channel and a new revenue model for companies, not just simply a cost issue of trying to manage and control. This is part of the whole rethinking of management and security in a world where it's much more mobile and much more outside the firewall. McCarthy: And there are all of those businesses that are going to emerge where people talk about data exhausts. We know what people are doing. The app store becomes a way for people to tap into that and you can start to monetize that. Gardner: And it strikes me that there shouldn’t be any reason that the same infrastructure that supports an internal app store wouldn’t also support an external one. Liu: No, it's very similar. Furthermore, we have an app store white paper that’s freely available as a download on our website, www.partnerpedia.com. Gardner: And John, any research reports or notes that are available on this subject from Forrester? McCarthy: There are a number of reports that we've done outlining kind of the future of mobile management. People can come to forrester.com and search the site and they'll find the stuff that myself and a number of colleagues have written relative to this topic.